In the peripheral nervous system, the myelin sheath of each axon in a nerve is wrapped in a delicate protective sheath known as the endoneurium. Within the nerve, axons targeting the same anatomical location bundled together into groups known as fascicles, each surrounded by another protective sheath known as the perineurium. Several fascicles may be in turn bundled together with a blood supply and fatty tissue within yet another sheath, the epineurium. This grouping structure is analogous to the muscular organization system of epimysium, perimysium and endomysium. 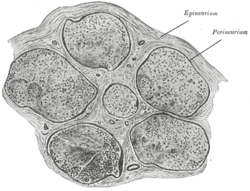 The perineurium is composed of connective tissue, which has a distinctly lamellar arrangement consisting of roughly 7-8 concentric layers. The perineurium is cellular, and is composed of perineurial cells, which are epithelioid myofibroblasts. Perineurial cells are sometimes referred to as myoepithelioid due to their epithelioid and myofibroblastoid properties including tight junctions, gap junctions, external laminae and contractility. The perineurium is a smooth, transparent tubular membrane which may be easily separated from the fibers it encloses. In contrast, the epineurium is a tough and mechanically resistant tissue which is not easily penetrated by a needle. 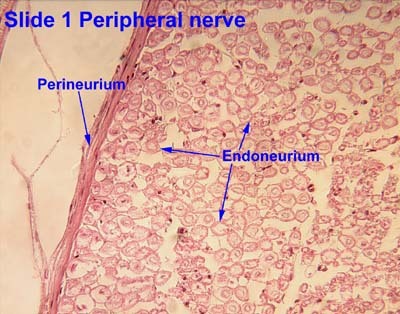 Histology image: 1_03 at the University of Oklahoma Health Sciences Center - "Peripheral nerve"
Anatomy photo: nervous/pns/nerve1/nerve2 - Comparative Organology at University of California, Davis - "PNS, nerve (LM, Low)"